I'm Jen Lampton, President of the board of directors for the NorCal Hunter Jumper Association. 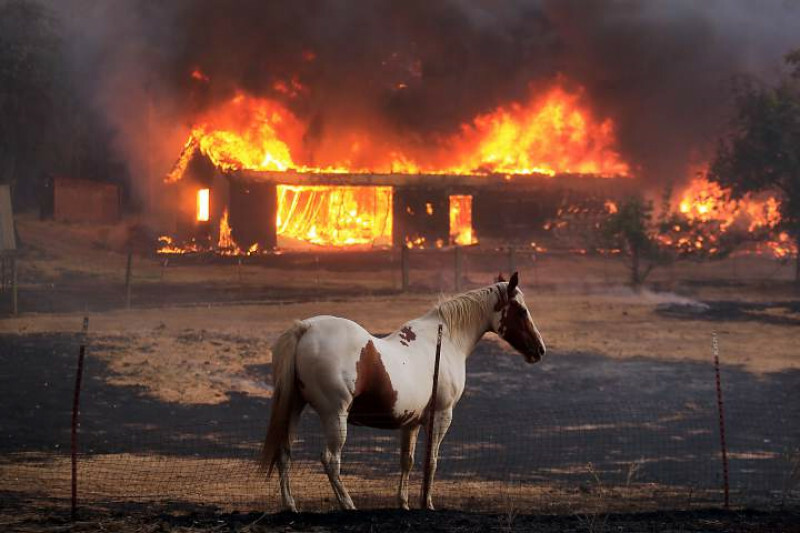 We are raising funds to care for horses displaced by the tragic Northern California fires. Horses have been evacuated. Some have escaped, and others had to be released by their owners in the hopes they would be able to find a way out on their own. Even once the horses are out of harm's way, the story isn't over. These horses still need care. Donations will be used to provide veterinary care or feed and bedding for horses that have been evacuated or are otherwise affected by the fires in Northern California. Your donation is sincerely appreciated! With concern for of our Northern California community that has been so grievously effected by this year's wildfires, we are asking for additional Donations. As many of you already know, Mandy Porter, 3-time FEI World Cup Jumping finalist, will be teaching our members at the NorCal clinic this week. Existing NorCal members are also welcome to come and audit the clinic. Mandy suggested that we add a fundraising effort to compliment the clinic. She has generously committed to donate half of her clinician fees to the effort and I hope, as a community, we can match or exceed her generous donation. Please donate what you are comfortable giving, any amount will help our community. This fall's Donations will be given to UC Davis' Center for Equine Health. Here is just a quick look at their contributions to those in need. Donations will be made in the name of Mandy Porter and the Northern California Hunter Jumper Association. With regards and concern for all of our Northern California Community that has been so grievously effected by this year's wildfires, we are asking for additional Donations. As many of you already know, Mandy Porter, 3-time FEI World Cup Jumping Finalist, will be teaching our members at the NorCal clinic this week. Mandysuggested that we add a fundraising effort to the clinic. She has generously committed half of her clinician fees to the effort and I hope, as a community, we can match or exceed her generous donation. Existing NorCal members are welcome to come and audit the clinic. Though it's free to audit, we would like to ask attendees to please donate any amount to help our community. This year's Donations will be given to UC Davis' Center for Equine Health. Thanks to everyone who has already donated, and to those who have shared information about our cause with others. The NorCal Hunter Jumper Association has been responding to urgent requests for feed, bedding, and other supplies. We are also reaching out to various facilities we know have taken in a significant number of horses to let them know that we are here to help, when needed. Most facilities have all the supplies they need right now, but we will be checking in with them again after the NorCal Medal Finals Horse show has concluded, as evacuations are still underway this weekend. Thanks to your early support, NorCal has been able to donate shavings and construction supplies to the more than 130 horses staying at the Vallejo fairgrounds.